Shinya Sakurai is a young Japanese artist, who lives and works in Turin, Italy. After majoring in Fine Arts at the University of Osaka, he started studying at Accademia Albertina, Turin. In his pieces Japanese and Western culture are intermingled. 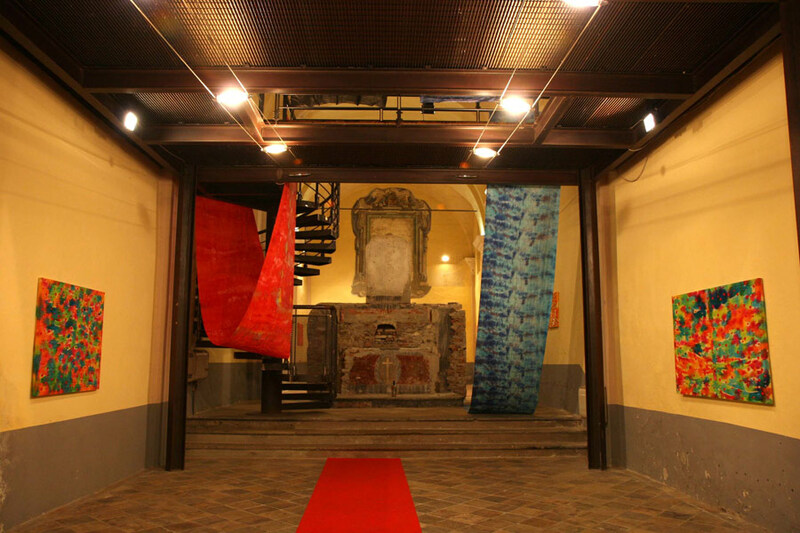 As we might notice in his Love Pool, the artist displays the traditional shibori, a method of dyeing cloth with patterns, next to the use of catholic symbols such as crosses and Madonnas, typical of Italian iconographic tradition. A pop flavour is conveyed by the recurrent heart shapes, one of his favourite logo. These hearts symbolise the thread which connects the artist to his homeland. At the same time they might conceive the longing for a world without conflicts. Through these emblems the artist exhorts the viewer to think about the role of memes and naive images in our culture, because they may instead reveal new perspectives. The Drifting Clouds – Kaori Miyayama | Masaharu Sato | Shinya Sakurai , curata da Antonio d’Avossa, Galleria Paola Verrengia, Salerno, Italia.